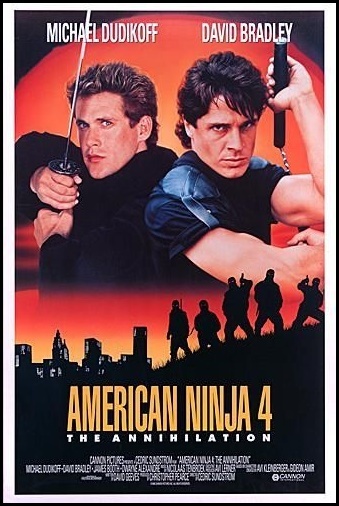 Chrichton's World: Review American Ninja 4: The Annihilation (1990): The worst in the franchise! Review American Ninja 4: The Annihilation (1990): The worst in the franchise! Director Cedric Sundstrom is a hack. This film is proof of that fact. He still has no clue what to do with ninja's and continues the parody path without actually offering the laughs. And the redeeming factors that were still present in American Ninja 3 are nowhere to be found. It's bad people. Sleep inducing bad. Michael Dudikoff is back but his presence is laughable. He appears after 45 minutes or so then has a few skirmishes and rescues friend Sean Davidson (David Bradley). Not a single explanation or flashback scene where we get to see how these two have become friends. It could be through Curtis (Steve James). But like I said no mention of this and worse no Steve James at all. Instead we get a guy named Brackston (played by Dwayne Alexandre) who is not even allowed to finish marrying. Supposedly the dedication to his job is more important than his future wife. I know this is intended as comic relief. But we never seen this guy before and I am supposed to root for him? To make matters worse his partner in crime Sean has been turned into a damsel in distress and is not given the chance to shine one bit. He is easily one of the most skilled and capable martial artist in the film and he is not allowed to do his thing. I read that David Bradley felt insulted with this plot element. And I agree. It is insulting since David Bradley pulls out moves so easily while Michael who apparently has been training in martial arts before American Ninja 2 can't even be bothered to do most of his own fights. Partly Kely McClung is to blame for this. He is Super Ninja in the film and also did the fight choreography. You read it correctly. Mike Stone who did the martial arts choreography in previous film (and also had a role as Tojo Ken in American Ninja 2) wasn't involved in this project either. So no Steve James, no Mike Stone and on top of that no George S. Clintion whose music helped made the action more exciting. But like I said the biggest culprit is director Cedric Sundstrom. He really has no idea to make the action exciting. The choreography doesn't flow one bit. Whenever people are fighting they are made to stop striking and then wait for the other to strike back. It is so slow that it easily could have edited in a way that it would have seemed faster. Again the fault of Cedric not to see how awful the choreography and editing was. BTW Super Ninja looks ridiculous. How anyone involved in the production let that slide is beyond me. Not only the choreography was slow. The whole damn movie was. With so little plot and so many ludicrous events going on you would think a director would at least increase the pace somewhat. Did I mention the rebels who seem to have been lifted straight from a Mad Max movie? If that news excites you then I am afraid I have to disappoint you again. Nothing significant is done with them. You see them battling ninja's very briefly and then they fight off screen. It is expected of you to assume that they are fighting hard and furiously for freedom and justice. How do you get rewarded for your patience? Dudikoff fights Super Ninja after they hold hands for a few seconds. Then Dudikoff blows him up with a grenade. One thing was neat though. A scene where Ninja magic was featured. Joe thinks he has found Sean but we know it can't be him since slightly before this scene we are shown how he is taken to be executed. This Sean acts like he is confused and disoriented but then gives a look so evil that it would make Chuck Norris crap his pants. I have to commend David Bradley for doing his best to take the film seriously and being a professional all the way. Any way Sean strikes Joe and then fight a little. Why the hell didn't they make the fight last longer? It's the most creative, interesting and fun scene in the film. It's over before you know it. This fourth part in the franchise is a travesty. Every American Ninja film up to this point was filled with fun and exciting action and this one can't even get that right. Avoid like the plague!